This 1.5" character shoe is made of a genuine imitation leather upper with a scored leather sole. Other features include a soft breathable lining, an attached ankle strap with a pin buckle, and an improved heel lift attachment. Excellent for tap or stage! Suggested Fitting: Same to 0.5 size larger than street. I bought these shoes for my school's production of hairspray (Which is a dance heavy musical) and 3 days after I got them, the pin buckle fell off on one shoe, luckily this was still during rehearsal so I took them to get them fixed. 1st show comes around and the other pin buckle fell off, which didn't cause any massive problems but I had an unsecured shoe the rest of the shows. On my last show, the "improved heel lift attachment" fell out which caused me to injure my ankle and the shoes made a screeching noise of the floor which was hard to stop. I was hoping these shoes would last me for at least 2 shows but it barely go me through my first one. These also get scratched very easily so be cautious! The only reason it has two stars is because after you break them in they are somewhat comfortable for being a character shoe. Thank god I got them about 2 weeks before tech, if I would have had these since the beginning of the show they definitely would have broken earlier and I would have no shoes for the shows. Our director recommended us these shoes so many of the people bought them, one girls "improved heel lift attachment" broke (like mine) and she slipped and broke her ankle during tech week, this could have been a bit of personal fault but if she had actually working "improved heel lift attachment" it definitely could have helped prevent the issue. (this is all within a 1-2 month time span) Okay so I was going to be in a production of Shrek the Musical and I thought i would need character shoes so I ordered the cheapest pair. That was my first mistake. I wore them to one rehearsal and all of the inside padding fell apart, so i ripped what was left of it out.I didn't even wear the shoes for the show. I was then in another production and I wore these shoes for the entire show and almost every rehearsal. The inside still sucked but i used them anyways. We just closed the production and wow. First of all they were wayyyyyy too big. I got a 7.5 and I wear usually a 6.5-7.5 in street shoes. I've twisted my ankle multiple times in the shoe. The bottom of a heel is also about to come off. These were a quick buy and i do not recommend I will hopefully get a better pair before my next production. The shoes looked nice but I bought a half size bigger than I take because the reviews said they run small. Because of all the shipping costs coming and going I will not order from this company again. I have not had much experience with character shoes, but I needed them for Madrigals. My teacher ordered some cheap, uncomfortable, stiff shoes that were hurting my feet to the point that my feet would go numb after awhile. 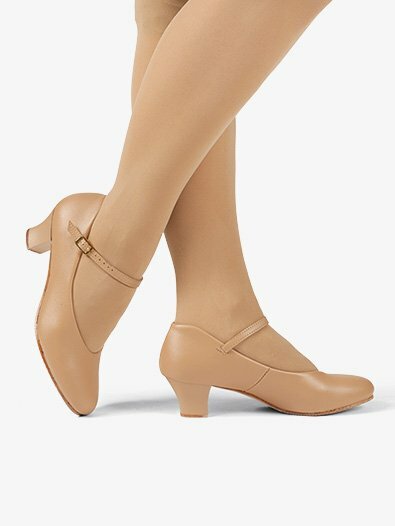 When I was told we would be dancing a bunch of swing dance numbers in our character shoes, I immediately decided to buy a better quality character shoe. These shoes are amazing! In contrast to the character shoes I was bought, these shoes are soft, comfortable, and they have enough flexibility in the material to comfortably move my foot without the shoe being floppy. I only ordered a 9, which is half a shoe size bigger than what I normally wear, but I ordered them wide because I was having more issues with my toes being squished. I purchased these shoes for a show I was in. I made the mistake of ordering on the large size (some reviews said they ran small) but found out they are true to size same as street shoes. Unfortunately they dont have return shipping and that was costly. Otherwise I am a person with sensitive feet and found them to be comfortable once I got the right size. I would definitely recommend them. We were told this item runs true to regular shoe size. Yet what arrived that was labeled as her regular size was clearly 2 sizes too big. Since she needed them for rehearsals immediately there was no time to reorder. Returning these and have had to find a store that we could drive to and try them on. The cost is that I have to pay shipping both ways for an item that is not satisfactory. Beautiful shoes, comfortable. Ordered size 6.5, fit perfectly. Very nice and fast shipping!!! Got here in three days. I am National Honor Thespian so I wear character shoes pretty often. These are some of the most comfortable I've ever worn. They seem nice, but I have to send them back for a smaller size. I normally wear a 7, but most of the reviews said they ran a half size small, so I ordered a 7.5 and they're to big. Other than that I really like these shoes and will be recommending to my Thespian Troupe! Great heel height and comfort for 8, 9, 10 year olds. First time purchase. My daughter's foot measures a women's size 5. Bought size 5. Shoe is too small. Returning and purchasing a size 5.5. We will soon see if it fits. Shoes were not wide enough. Shoes said they were wide but they weren't. My daughter couldn't even wear them. But we thought the shoes were nice just not wide enough. This shoe looked very puffy and big on my foot, like a marshmallow. Was a tag big and looked awful. Immediately returned and kept the other pair of a similar style that were much slimmer and better looking on. The buckle is a slip buckle. My daughter accidentally turned the strap before putting it in and it got stuck. But even the right way it is hard to adjust. unlike Capezio's, these were not true to size, so what i saved on trying them out, i am more than paying in returning them. The shoes are very comfortable but what I really liked was the service. Somehow the size on the box didn't match up with the shoes inside so they didn't fit. When I called they were so polite and I got my replacement shoes just a few days later. Fantastic service! They chose to donate the first shoes so I got them to a local community theater. Pros: These look great. They feel comfortable. They were inexpensive compared to similar character shoes. Cons: The buckle broke within about 2 of 3 weeks of wear. These are obviously cheaply made. I'm now keeping my shoes on with a twisty tie. We bought my child's true size yet in a wide width, because her foot is on the wide side though she wears normal width shoes. I figured from the reviews that I'd rather her have room than have squished toes. She says it's rubbing a little on the side but that's to be expected. I'd buy this good value again. I have actually only worn these shoes one evening at this point - two classes - cha cha and Argentine tango. 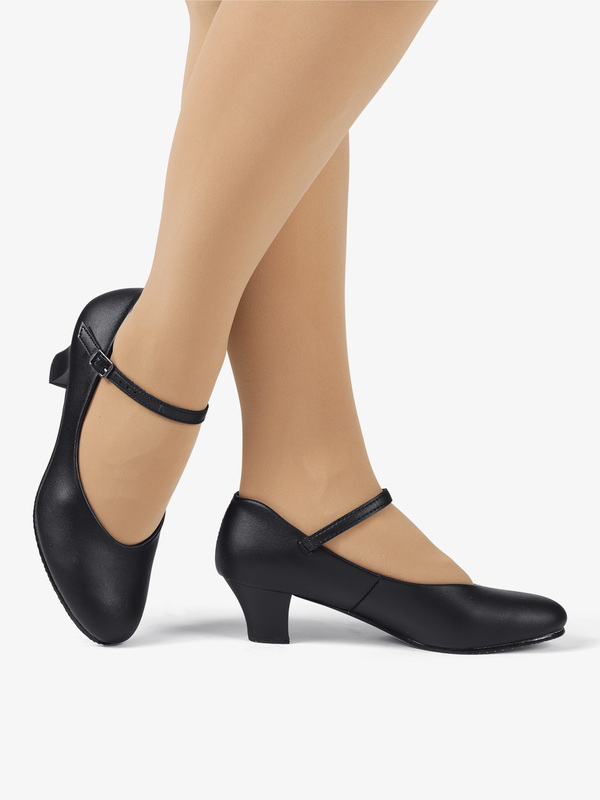 They were quite comfortable and I think they'll be great for all my ballroom/Latin classes. I can't say anything about durability since I've just started wearing them! 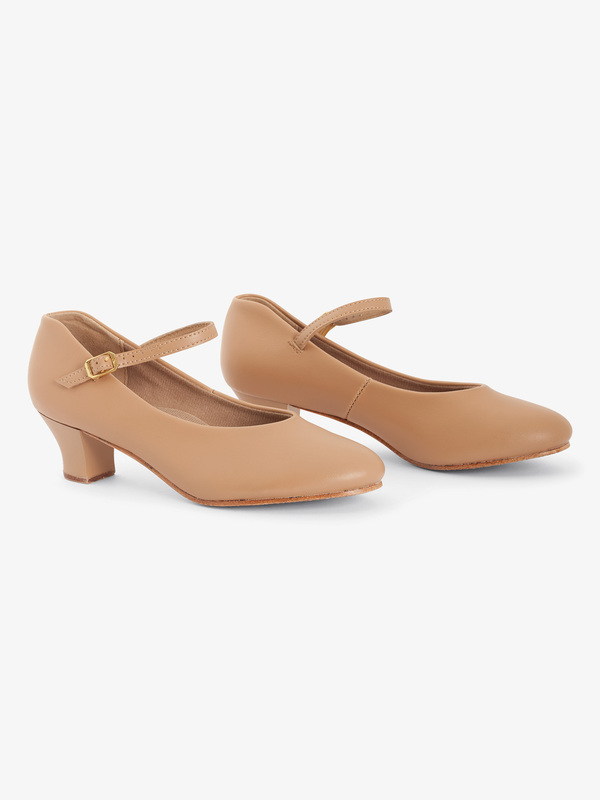 I bought these shoes for my daughter, who is taking a dance class as well as theater in high school. She will be able to wear these pretty, comfortable, and sturdy shoes in her classes, as well as wear them out during a dressy occasion. They're well made and have no rough edges anywhere inside the shoe. I am definitely impressed and would recommend them. I have ordered these shoes twice for my daughter, and she still does not have a pair that fit. Her regular shoe size is a 6, and other reviewers said to order a size up. I ordered a size 6.5 and they were huge. I then ordered a size 6, and they are still too large. Now I have two pair to return, and don't know what size to order. Overall, these shoes run very large. 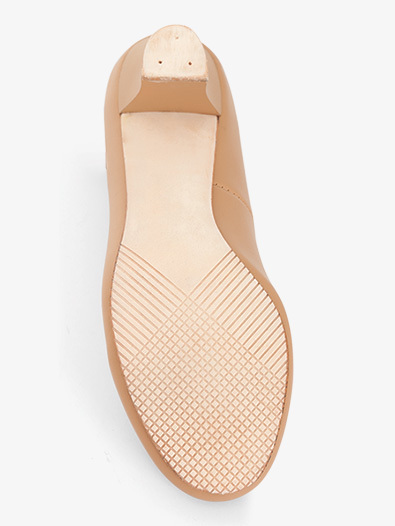 I am solidly a 7.5 street shoe, and ordered this shoe in a size 7. It was still about a half size too big. Besides this issue, on one of the shoes, the buckle was sewn on backwards! 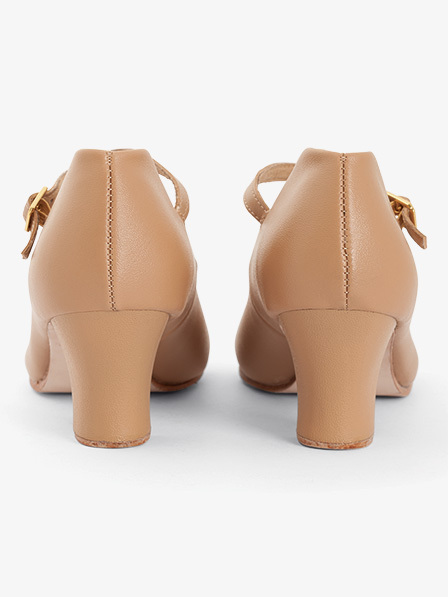 Not that it would have mattered much if it was sewn on correctly, because the buckles on these shoes are not like normal ones, and slip loose easily. 0/10 would not recommend. I bought these shoes because they were cheaper than the other character shoes and most of the reviews were good. I wear a size 7, but i got a size 7.5 and they fit perfectly. I also got the M and not W. My feet are not very wide, but they are also not slender, so i was a little weary about this. They fit my width perfectly though. I definitely recommend getting a wide if you consider your feet to be wide. I am using these shoes for a jazz dance and they work well. they are very slippery, but are better with rosin and after they have been worn on the bottom. they were also comfortable overall. I tried them will tights and socks, and my toes were not squished. The only part that was uncomfortable was that the shoe dug into the sides of my heels. It wasn't unbearable though, just uncomfortable. This might just be part of all character shoes, I'm not sure. Anyways, i hope this helps! I ordered these shoes for my theater class and all the reviews I read said try ran about a size to a size and a half small. I Haeckel a street size 8.5 so I ordered a 9.5 when they came they were about a half size big and now I wish I ordered a 9 :/ still fit okay and I'm still going to wear them but their not as small as everyone says they are. I bought these shoes for my daughter who has a long, narrow foot (most shoes are too wide for her) and even she could barely squeeze into them. The length was perfect to size, however, I would estimate they're an A width and not the B (medium) stated in the description. The overall quality appeared good, however, I cannot attest to their comfort or durability as she never got the chance to wear them. If you have a very narrow foot, these may be the shoes for you. The suggested fitting for this shoe is to order 1 size smaller than street shoe. This shoe also tends to run narrow. Do these shoes come with the taps?? I want these for tap shoes do you sell them separately? This particular style does NOT come with taps, but we do sell them separately. Please contact Customer Service at 1-800-470-1664 for assistance in fitting. We also offer style T9800 which does come with taps. I'm usually an 8.5 street shoe size. I've heard this shoe runs very very small. How many sizes up from my regular shoe size should I order this shoe!? The sizing for this item does state to order the same as street shoe size. If you would like a little more room for a more comfort fit, you can go .5 size larger. does this shoe have the rounder toe box or the more tapered narrower toe? My first Capezio shoes were the t-strap character shoes and were comfortable from day one. When I replaced them with last year's version, the toe box was more tapered and pinched my toes so badly that i've never been able to keep them on for more than 5 minutes. I've now decided I will try the shorter 1.5 inch heel, but don't want to bother if this has the tapered toe box. Do the adult 11/2" character baby louis shoes run narrow like someone said in a review? Our Theatricals Department says that they have not had any comments on the medium width of this shoe running narrow, however the T9800 Baby Louis that comes with the taps attached runs a little wider than the T3100.